The JAI Spark models feature CMOS sensors capable of capturing high resolution images at speeds as much as 10 times faster than traditional CCD cameras. Spark cameras are available with three sensor resolutions, 5, 12 and 20 megapixels. With the various interfaces available, the Spark series includes more than 15 different models. True correlated double sampling, analogue and digital gain control, and in-camera pattern correction are some of the features that help to produce outstanding image quality. All 3 sensor models of the Spark cameras offer a CoaXPress connection option. 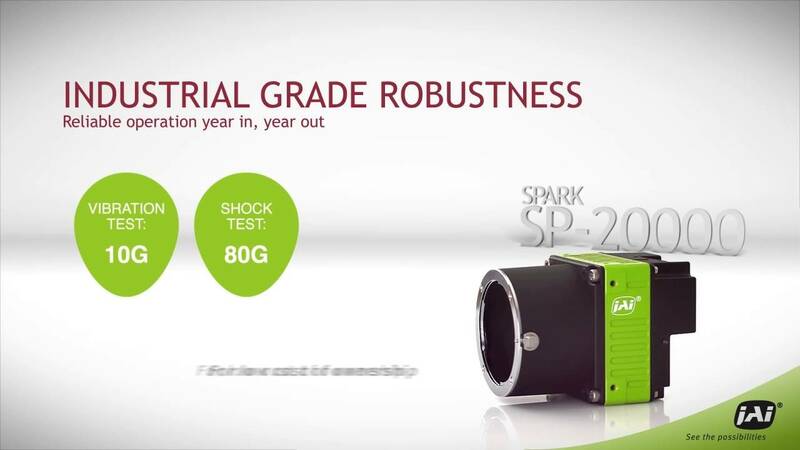 The Spark Series SP-20000 is a high performance CMOS industrial camera providing 20 megapixel resolution at 30 frames per second. JAI’s Spark series offers built-in automatic level control (ALC) linking shutter, gain, and iris for optimized exposure under changing light conditions. The advanced auto exposure function is designed for outdoor applications such as security and traffic applications where the scene illumination is constantly changing. Implementation effort can be tremendeously reduced, as the system adjusts itself to dynamic lighting conditions. Spark cameras have a rugged design that enable it to cope with extreme temperature (SP-20000 - Min / Max -45°C / +70°C), high vibration (max 10G) and high shock occurrences (max 80G). This design gives the Spark the highest standards for industrial ruggedness, reliability and durability in harsh environments. As well as incorporating sensors with large, low noise pixels, the Spark series feature advanced in-camera functions. High dynamic range modes, pattern correction, true correlated double sampling, analog and digital gain control, and efficient global shutters are a few of the features that ensure low noise, high quality images with an impressive megapixels-per-second performance. A number of models provide a CoaXPress interface, which allows larger data rates compared to CameraLink as well as the usage of longer cable lengths. This makes it possible to bridge larger distances between the camera and the host system and creates more flexibility for the entire setup. JAI SP-12000C-CXP4-F 12.6 188.8 F-mount 4096 3072 1.2"
JAI SP-12000C-CXP4-F-XT 12.6 188.8 F-mount 4096 3072 1.2"
JAI SP-12000M-CXP4-F 12.6 188.8 F-mount 4096 3072 1.2"
JAI SP-12000M-CXP4-F-XT 12.6 188.8 F-mount 4096 3072 1.2"
JAI SP-12401C-PGE-C 12.3 9.3 C-mount 4088 3000 1.1"
JAI SP-12401M-PGE-C 12.3 9.3 C-mount 4088 3000 1.1"
JAI SP-5000C-CXP2-C 5.2 211 C-mount 2560 2048 1"
JAI SP-5000C-CXP4-C 5.2 253 C-mount 2560 2048 1"
JAI SP-5000C-GE2-C 5.2 44 C-mount 2560 2048 1"
JAI SP-5000C-PMCL-C 5.2 137 C-mount 2560 2048 1"
JAI SP-5000C-USB-C 5.2 62 C-mount 2560 2048 1"
JAI SP-5000M-CXP2-C 5.2 211 C-mount 2560 2048 1"
JAI SP-5000M-CXP4-C 5.2 253 C-mount 2560 2048 1"
JAI SP-5000M-GE2-C 5.2 44 C-mount 2560 2048 1"
JAI SP-5000M-PMCL-C 5.2 137 C-mount 2560 2048 1"
JAI SP-5000M-USB-C 5.2 62 C-mount 2560 2048 1"